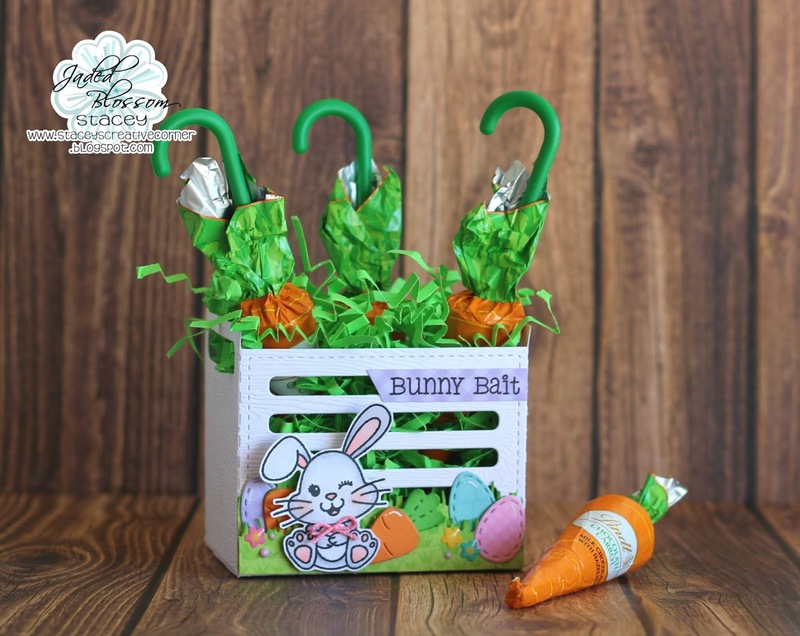 Stacey from Stacey's Creative Corner here to share a super cute Easter themed treat with you that I created using those awesome Jaded Blossom stamps and dies! Isn't this cute?? I created it by using some wood grain cardstock and the Crate Die. I added two layers of grass by using the Spring Dies and some fun patterned paper from Doodlebug. I popped one layer of grass up with foam tape so that I could easily tuck some of those eggs and carrots from the Spring Banner Dies behind as well as place some in the front. I think that gives the box a bit more visual interest. I colored that sweet little bunny from the Sweet Bunnies stamp set with my Copic markers and added a face from the Bunny Faces stamp set. I fussy cut her out and popped her up onto my box with more foam tape. I added a few enamel flowers from Doodlebug, some Nuvo drops and a little crochet bow to complete my little scene. I added my greeting from the Easter Treats 2 stamp set onto some purple patterned paper and attached it to the top of my box. I placed some green crinkle paper inside along with my carrot shaped candies (aka "bunny bait") and this project was complete. I think it turned out so adorable!! Thanks so much for stopping by today and taking a look at my latest creation!